A well organized transportation can add a lot of comfort to your vacation. Airport van rentals are a must when you are travelling so that you can have the right kind of vehicle pick you or/and drop you from/to the airport. In this way you will not have to run around for a taxi or try to find the directions to the place that you want to go. It does not matter, you might visit places like Los Angeles or San Francisco on a one day business trip or go with friends to Las Vegas for a holiday, airport van rentals always come in very handy. Therefore it becomes very essential for you to pick the right kind of airport van rentals service. Los Angeles Van Rentals is your national van rental service provider with a large fleet of vans, ready to pick you from the airport and drop you back. In fact you can hire a van for your complete trip when you are at a new location. With an easy to book online system you can opt for van rentals for the dates that you are going to travel. We will ensure that you can have a well equipped and maintained van at your service. With years of experience as a premiere van rentals service provider, we have been able to understand the needs of a traveler and have ensured that our staff and vans provide you the required service with great efficiency. 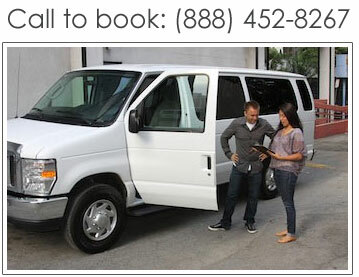 At Los Angeles Van Rentals, you can choose to opt for a simple airport van rentals service at Los Angeles, Las Vegas, San Diego, San Francisco, Orange County, Burbank, Long Beach, Sacramento, Phoenix and other cities. On the other hand you will also find a comprehensive rental service that you could hire for a longer trip. You can also request for a chauffeur driven vehicle (at an additional cost) in case you are too tired of bored of driving and want to sit back and enjoy your trip. Contact us to know more or book a van online!